Quiche Lorraine is a pastry dough topped with cheese, butter, foie gras and onions. It is believed that the origin of the Lorraine is in the rural region of Lorraine, France. Originally, Quiche Lauren was kneading an open cake of bread dough filled with pudding and smoked bacon. To cook the original tap, use a cast iron pan. When I was a child, a long time ago in the 1980s, my mother used to make quiche loren according to the budget, you could call it Quiche Lauren for the poor: with yellow cheese, white fried onions and pastrama. True, it was not the same but it was delicious! 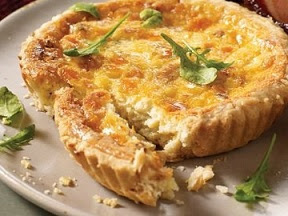 Despite our in-depth research, we did not find the reason why this day was chosen as Quiche Lauren's day, but still, in honor of May 20, it is today to find a recipe and prepare a quiche Lorraine for the whole family. And if you don't eat meat, you can use vegetarian sausages.